To Cite: Wen Y, Zheng Y X, Tan D M. A Comprehensive Long-Term Prognosis of Chronic Hepatitis C Patients With Antiviral Therapy: A Meta-Analysis of Studies From 2008 to 2014, Hepat Mon. 2015 ; 15(5):e27181. doi: 10.5812/hepatmon.15(5)2015.27181. Context: Attaining a sustained virological response with antiviral therapy is a sign of clinical cure for chronic hepatitis C patients. The aim of this meta-analysis was to evaluate the long-term efficiency and outcome of antiviral therapy in patients with hepatitis C who attained a sustained virological response. Evidence Acquisition: A literature search was performed on published articles between January 2008 and February 2014. Patients with Hepatitis C who received interferon with or without ribavirin therapy were enrolled. Relative risks were estimated using either fixed or random effect models. Results: Patients who attained sustained virological response had a less risk (85%) for all-cause mortality and about 63% reduced risk of hepatocellular carcinoma incidence than those who did not achieve sustained virological response. Based on deeply analysis, the stage of liver fibrosis was a risk factor at baseline for the incidence of hepatocellular carcinoma. Conclusions: Sustained virological response can reduce all-cause mortality and the incidence of hepatocellular carcinoma of patients with hepatitis C. Advanced liver fibrosis is still a risk factor for the incidence of hepatocellular carcinoma, in spite of hepatitis C patients attained a sustained virological response. Chronic hepatitis C (CHC) is one of the most important viral infections, which affects more than 185 million people worldwide, accounting for approximately 3% of the world population and leading to 499000 deaths annually (1). Almost 30% of patients with HCV develop cirrhosis annually and at high risk of liver failure and hepatocellular cancer (HCC) (2, 3). Since HCV discovered in 1989 (4), promising milestones had been achieved in treating HCV infection, especially interferon (IFN) therapy. Achieving a sustained virological response (SVR) is an indicator of successful therapy for HCV infection (5, 6). SVR means undetection of HCV in the blood for at least six months after the completion of anti-HCV therapy using high sensitive real-time polymerase chain reaction. Although the DAA (direct acting antivirals) showed a bright prospect for curing the CHC, the standard therapy, interferon combined ribavirin, is still widely used in developing countries with most CHC patients. With the standard therapy, SVR rate might be different with different conditions or factors, while some areas and patients could achieve very high rates (7, 8). Some predictors were found to indicate SVR possibility for patients; for example, interleukin-28b gene polymorphisms play a quiet role to predict treatment response (9, 10). SVR predictors in the standard therapy had been deeply investigated; however, long-time outcome of SVR still needs to be further studied. Patients achieved SVR had improvements in liver histology and low risk of HCC and liver-related mortality (11, 12). However, Bisceglie et al. suggested no change in the incidence of HCC in patients with advanced fibrosis and persistent viremia who achieved SVR (13). Considering the need for clinical evidence and inconsistent results from relevant studies, the present meta-analysis was designed to pool the currently available data to determine the benefit of SVR for prognosis of patients infected with HCV and baseline factors. A comprehensive search was conducted for studies published between January 1, 2008 and February 30, 2014. The search was conducted in the databases including Web of Science, Cochrane Library, Cochrane Central Register of Controlled Trials, EMBASE, OVID, MEDLINE, PUBMED and Google Scholar using the following terms; Interferon (IFN) or Peginterferon (PEG-IFN), ribavirin (RBV), Chronic hepatitis C (CHC) or Hepatitis C virus (HCV) and (Prognosis). Case-control studies and cohort studies were included if they were published in English and used therapies of Peg-IFN/IFN with or without RBV and SVR as a primary or secondary endpoint. The patients who received complete treatment course with no matter of whether they attained SVR or non-SVR for all HCV genotypes included in this meta-analysis. Studies presenting information exclusively about patients undergoing liver transplant, other hepatitis, acute HCV, decompensated cirrhosis with HCC, autoimmune liver disease, non-alcoholic fatty liver disease (NAFLD), alcoholic fatty liver disease (AFLD) and post liver transplant patients, were excluded. Two authors (YW and YXZ) evaluated each potentially eligible study independently. If evaluation results were controversial, a final consensus was reached. Data including publication details, type of study, baseline characteristics of patients, information about the disease, treatment strategy, clinical outcomes (all-cause mortality and the incidence of HCC), duration of follow-up and evaluation criterion during the follow-ups were extracted. RevMan 5.2 (Nordic Cochrane Centre, Cochrane Collaboration, Copenhagen, Denmark) was used to perform statistical analysis and meta-analysis. The Mantel-Haenszel method (M-H) was chosen to pool the studies. The meta-analysis of observational studies in epidemiology was performed according to proposed guidelines by MOOSE group (14). According to meta-analysis inclusion criteria, the following data was extracted from the literature: 1) patients’ general information including original number of subjects, author, date and journal details; 2) study characteristics including the study design, the number of patients enrolled and controls and control of confounding factors. The values of risk ratios (RRs) were used to assess the risk estimate for cohort studies; while, odd ratios (ORs) were provided for case-control studies, which were regarded as approximate RRs in this meta-analysis. The heterogeneity of studies was tested using the χ2 square test and I2 statistic. If a significant heterogeneity (the χ2 square test P < 0.10) was found, the random-effect model was used in the analysis, and if the heterogeneity was considered to be not significant (the χ2 square test P ≥ 0.10), the fixed-effect model was used. Studies with substantial heterogeneity (I2≥ 50%) are not suitable for meta-analysis. In this meta-analysis, the potential risk of HCC and all-cause mortality between HCV patients of SVR and non-SVR was assessed. The combined RR was displayed in the Forest plot. In deeply analysis, some baseline characteristics of patients before receiving treatment such as gender, genotype or the stage of liver fibrosis were assessed in SVR groups. A total of 1839 relevant publications were initially identified through online searching. Most ineligible studies were excluded based on information in the title or abstract. The selection process is shown in the flow diagram in Figure 1. Finally, nine publications met the inclusion criteria for the meta-analysis of SVR versus Non-SVR and five studies were included to analysis the baseline characteristics in SVR groups. 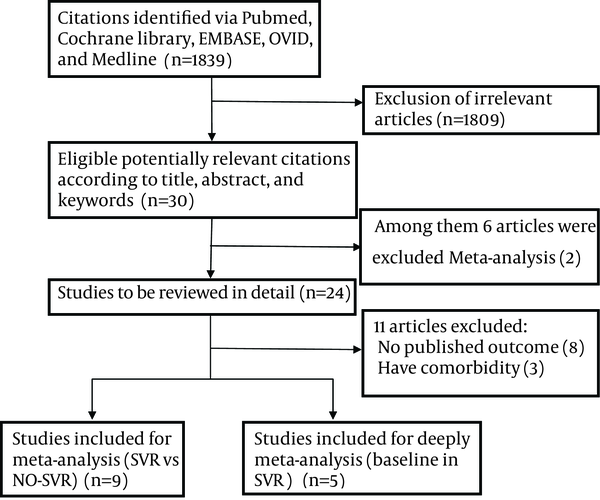 According to the aforementioned search results, nine articles (Table 1) were finally included in the meta-analysis for SVR versus non-SVR, and all of which were cohort studies. These studies were conducted in five countries including the United States, Japan, Italy, France, and China. They were all expected to represent the prognosis (death and HCC) of patients infected with HCV and their SVR or non-SVR. Overall, 18837 patients with HCV were followed up after a standard care of therapy; among them 8226 patients achieved SVR, while 10611 patients were not and 19 patients died and 29 patients developed HCC. Five studies were included in deeply meta-analysis for baseline characteristics in SVR groups (Table 2). a Abbreviations: HCC, hepatocellular carcinoma; and SVR, sustain virologic response. The all-cause mortality between patients with HCV who attained SVR and non-SVR in the long-term follow-up was examined (15-22). Due to Wang et al. (23) did not involve all-cause mortality data, so did not include this group. A significant homogeneity was found among the included studies in this meta-analysis (χ2 = 3.69, df = 5 (P = 0.59), I2 = 0%). Data was pooled from studies with RR = 0.16, 95% CI = [0.10-0.25] to assess the risk of all-cause mortality. 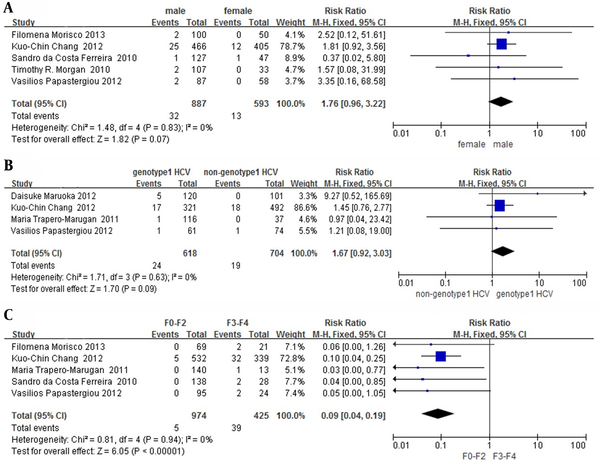 It was concluded that SVR reduced about 84% risk of all-cause mortality than non-SVR (Figure 2). The heterogeneity of the studies was tested using χ2 test and I2 statistic. If a significant heterogeneity (χ2 test, P < 0.10) was found, the random-effect model was used in the analysis, and if the heterogeneity was not significant (χ2 test, P ≥ 0.10), the fixed-effect model was used. Studies with substantial heterogeneity (I2 ≥ 50%) are not suitable for meta-analysis. The studies (15-21, 23) included for assessing the risk of HCC showed a good homogeneity (χ2 = 7.27, df = 5 (P < 0.20); I2 = 31% ＜ 50%). Through pooled analysis of included studies with RR = 0.37, 95% CI = [0.23 - 0.58], it was concluded that SVR might be a protective factor against HCC (Figure 3). SVR reduced about 63% risk of HCC compared with non-SVR patients. The heterogeneity of the studies was tested using χ2 test and I2 statistic. If a significant heterogeneity (the χ2 square test P < 0.10) was found, the random-effect model was used in the analysis, and if the heterogeneity was not significant (χ2 test, P ≥ 0.10), the fixed-effect model was used. Studies with substantial heterogeneity (I2 ≥ 50%) are not suitable for meta-analysis. Although patients who attained SVR had low risk of HCC, HCC could still occur. The deeply analysis aimed to discover whether the baseline characteristics of patients who attained SVR would be a factor for HCC risk. As seen in Table 2, we supposed gender, genotype (HCV) and fibrosis level as factors for HCC risk of SVR patients. All studies (I2 =0) showed well homogeneity after the heterogeneity test. Although pooled RRs of gender and genotype shown in parts A and B of Figure 4 were respectively 1.76 and 1.67, their 95% CI contained 1. Gender and genotype might not play significant role in the risk of HCC in patients who attained SVR. However, pooled RR of fibrosis level was 0.09, while the 95% CI [0.04, 0.19]. It means that patients who achieved SVR might have a high risk of HCC, if they had advanced liver fibrosis before the treatment. The heterogeneity of the studies was tested using χ2 test and I2 statistic. If significant heterogeneity (χ2 test, P < 0.10) was found, the random-effect model was used in the analysis, and if the heterogeneity was not significant (χ2 test, P ≥ 0.10), the fixed-effect model was used. Studies with substantial heterogeneity (I2 ≥ 50%) are not suitable for meta-analysis. Qu et al. (29) demonstrated that the incidence of HCC was significantly lower in IFN-treated than untreated patients with HCV infection. The long-term prognosis of treated patients who got different curative effect had less been studied. This meta-analysis was designed to confirm the benefit of SVR in the long-term prognosis and to make sure whether the baseline factors before treatment could affect the incidence of HCC in patients who achieved SVR. The results of the present meta-analysis indicated that patients infected with HCV who attained SVR had an 85% reduction in all-cause mortality risk (RR = 0.15, 95% CI = [0.10-0.24]). In addition, patients with SVR could have 63% reduced risk of HCC (RR = 0.37 95% CI = [0.23-0.58]) than non-SVR patients. Although, SVR would be regarded as a sign of clinical cure and with reduced risk of HCC for patients with SVR, HCC might be unavoidable to all patients with CHC. A previous study results suggested that patients with CHC who had no evidence of virological relapse might still have the risk of HCC (27). The mechanism of HCC development in patients with SVR is elusive. HCC development is not directly related to HCV replication. The incidence of HCC may have some association with hepatic regeneration and hepatocyte cycling that occurs after antiviral therapy and may activate the cellular pathways leading to dysplasia and thereby increasing the risk of HCC (30). The results of our research were consistent with Morgan et al. (31) that SVR was a protective factor in the incidence of HCC. However, SVR patients with a risk factor for the occurrence of HCC were unknown. We tried to find that which baseline status before treatment would affect HCC risk in patients who achieved SVR. Interestingly, the liver fibrosis stage might be the most important attributing factor. Patients who had a mild fibrosis before treatment might have 91% reduced risk of HCC (RR = 0.09, 95% CI = [0.04-0.19]) compared to patients with CHC who had advanced fibrosis (especially cirrhosis) before treatment, while all patients attained SVR at last. The reason might be explained by the fact that liver fibrosis staging would actually represent the degree of liver damage and accordingly the higher stage of liver fibrosis would represent more serious liver damage. Based on the results of this meta-analysis, the authors concluded that earlier treatment, especially before the development of advanced liver fibrosis, would benefit more for patients with CHC. As we see, the benefit of SVR for CHC patients was apparent, which would reduce the risk of all-cause mortality and HCC. Even, some studies indicated that SVR would reduce the risk of relapse in HCV infected transplant patients (32). However, patients achieved SVR still need long-time follow-up, especially some who already had advanced fibrosis before treatment, because of HCC risk. The above told us two things: Firstly, screening HCV is important, especially in some developing countries, hepatitis super-infections were widely in high-risk populations (33). Early treatment would avoid fibrosis development, which indicated better long-time prognosis. Secondly, liver fibrosis must be detected for all HCV patients. Percutaneous liver biopsy with ultrasonography is a quick, effective and safe procedure (34), while noninvasive tests such as fibro-scan and fibro-test, could provide live fibrosis information as baseline. The present meta-analysis had some potential limitations. Firstly, the final results of this meta-analysis are greatly affected by limitations of the included publications. Secondly, as the numbers of literatures included in this meta-analysis are small, predicators for patients with or without an SVR on all-cause mortality and the incidence of HCC may not be accurate. Thirdly, there are differences in antiviral therapy using IFN and PEG-IFN with or without RBV that may lead to different effects on long-term outcomes. This may have biased the meta-analysis results. Fourthly, due to the limited available literature, gender, degree of fibrosis and genotypes were selected to evaluate SVR achievement and these parameters could not comprehensively conclude the baseline factors. This meta-analysis clearly demonstrated that SVR was a protective factor for HCV patients against HCC and all-cause death. For HCV patients, advanced fibrosis status before treatment, might increase HCC risk even in patients who achieved SVR. The earlier treatment for patients with CHC, the better long-term prognosis. We are very grateful to the Pro. Cuimei Liu, PhD Xiaoyu Fu, for their advices to our work.